Discover how these materials can work in your classroom. For each study, you'll find a scope and sequence, three sample lessons, and other resources. 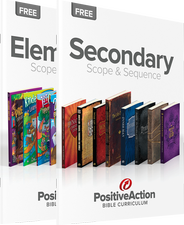 Positive Action for Christ is a nonprofit publishing ministry specializing in Bible studies and curricula. For over 40 years, we've helped teachers magnify the majesty of God to their students. Get lesson-by-lesson information for our preschool, elementary, middle school, and high school curriculum. 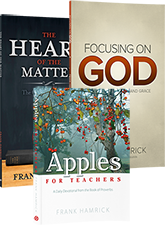 Available for a limited time, free digital copies of Heart of the Matter, Apples for Teachers, and Focusing on God.